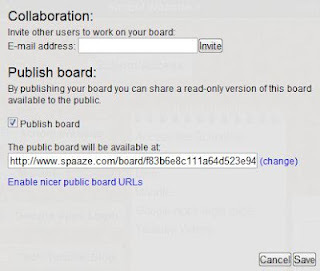 Ed Tech/Web 2.0 Tools for Educators and Students: Create a virtual corkboard/presentation using Spaaze. 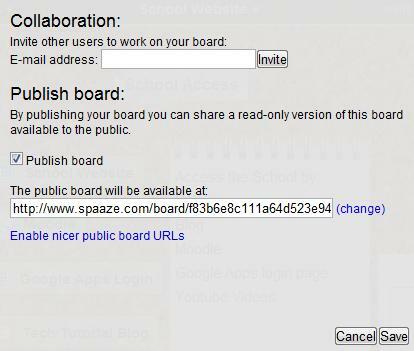 There are many virtual cork boards out in cyber space, but few can rival the power the Spaaze can give its user. For those who haven't tried virtual cork boards as an education there is no time like the present time to get started and thinking outside the box on how you and your students present ideas. What are some advantages of Spaaze? An extremely large canvass in which you can post many items. Publish the board publicly, generate a link and then post that link somewhere that your students can find it and then they will be able to access the board. 1. 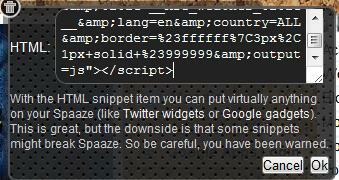 Go to http://www.spaaze.com and create an account. 2. Once you have created an account you will now be take to your first board. There are a couple of links that you can take a look at and then delete once you are done. To delete anything on your canvass just left click and hold the item. At the bottom you will see a Recycle bin icon appear. Just drag the item to the Garbage. 3. To add items to the peg board just click the "plus" symbol towards the top. 4. You will now be presented with 7 different items you can add to the board. 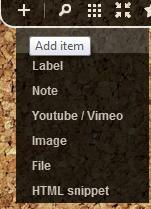 The label option will allow you to add titles and text to your board. 5. The "Note" option will give you a notepad. As you are editing the note you see a "Garbage can" icon which again will allow you to delete it. After you are done editing make sure you click the "Check mark" to save the changes. 6. The bookmark option lets you add websites to your document. This is neat because you can view the website directly within your cork board document. 7. When you choose the "Image" item you will be able to either upload an image from your computer or use an image URL. 8. You can also add files to your document so that students can get access to specific documents you would like the to view or download. 9. 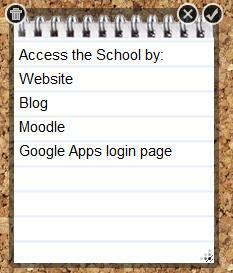 If you would like to add a Widget or Gadget such as a google calendar, you can sure do that as well. This will add some aesthetic and entertaining appeal to your virtual cork board. Just go to a Gadget or Widget site, copy the code and then paste it into the HTML box provided on your cork board. Click OK and you are all set. 10. At the top you will see an Icon that looks like a tic tac toe board. Click it to maneuver around your board. Play with this button to view how large and spacious your cork board actually is. 11. If you click this section you can change the Board settings, publish your board so that your students can view it, export all the files, videos and images to your machine, or create a new board. 12. 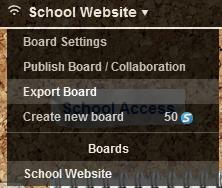 After selecting the "Publish Board/Collaboration" option, you can then invite others, students or teachers, to actually help create your board and you can make your board public so others can view the files, images, content, and videos on the web. 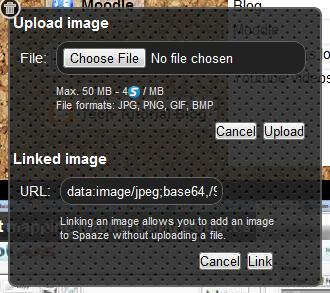 Here is the link to my Spaaze board that I created for this tutorial. If you click the link you will be able to see what the students will see. Notice that students can't add or delete items to your space making it pretty secure.